You have an in-depth personal intake interview prior to starting your course. In it, the trainer wants to get the best possible impression of what you are already able to do in the language and the situations you need it for. Your course is completely designed around the information gleaned from this conversation. A chance to get to know you a bit, introduce you to the institute and perhaps a tour of the building. The trainer briefly interviews you in the language you wish to learn. This information, in combination with the test you take, allows us to make a reliable assessment of what you are currently capable of in the language. What exactly do you want to learn? What situations do you need the language for? Do you have a preferred learning style? These are the kinds you questions you can expect from the trainer. Afterwards, he or she will talk with you about the general shape your training programme could take. You can opt to have an intake appointment by telephone, Skype or in-person at Language Institute Regina Coeli in Vught. Would you like to book an intake? Before you start a language course, you will have an intake interview with a language trainer. 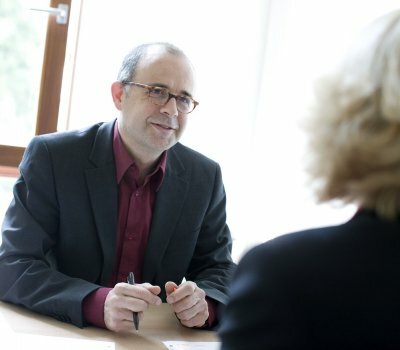 Having such an interview is a good way to find out whether our training courses suit you. If you would like to plan an intake, please contact us. Go to My Regina Coeli and take the test for the language you wish to learn. The test begins with simple questions and they become progressively more difficult. The more you get right, the longer the test takes. What kinds of situations do you need the language for? What kinds of subjects do you need to talk about in those situations? How do you communicate? In conversations, through presentations, in writing? The more thoroughly you can answer these questions, the better we can tailor the course to your specific needs. Part of the conversation is in the language you want to learn. If you do not speak it regularly, you can warm up by listening to the radio, watching television or reading something in the language.